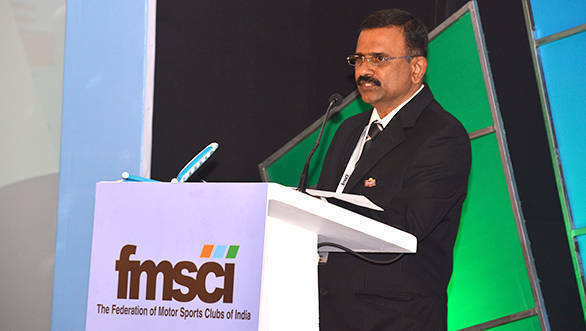 J Prithiviraj has been elected president of the Federation of Motor Sports Clubs of India (FMSCI) at the body's annual general meeting earlier today. Prithiviraj, who is part of the Coimbatore Auto Sports Club (CASC), has served as President of the FMSCI for one year - 2014 - in the past. He was unanimously elected to the post, taking over from outgoing president Akbar Ebrahim, who has served out his two-year term at the helm of the governing body of Indian motorsport. Shivu Shivappa of the Karnataka Motor Sports Club (KMSC) has been elected as the vice-president of the FMSCI, also being elected unopposed. In addition to the president and the vice-president, the council members were also elected to the FMSCI. The eight elected council members are: Vicky Chandhok (MMSC), Farokh Commissariat (IARC), Sita Raina (CMSC), Akbar Ebrahim (Meco MS), Arindam Ghosh (RRPM), Farooq Ahmed (MSCC), B Vijaykumar (Spitfire MS) and Sanjay Sharma (PCRT). Soon after his election, Prithiviraj stated, "This is a proud moment for FMSCI. We all have a common goal now and I am sure this powerful council can do wonders to motorsports in the country."